Richard Tillinghast, a celebrated American poet and critic, lived for a year in Ireland in the early 1990s and then returned each year until he became a resident in 2005. From an insider/outsider perspective, he writes vividly and evocatively about the land and people of his adopted home, its culture, its literature, and its long, complex history.Tillinghast orients the reader to Ireland as it is today. Following its entry into the European Union, Ireland changed radically from an impoverished, provincial, former British colony to a country where a farmer takes his wife on skiing holidays in Switzerland and is proud of his wine cellar, to one now home to immigrants from Europe, Africa, and Asia. 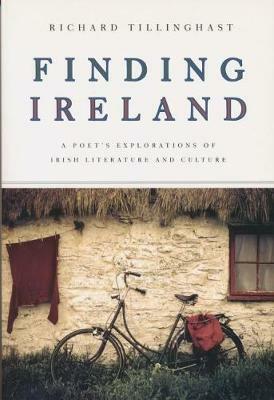 For many Americans - Irish Americans in particular - Ireland is a mythic and timeless land; from his unique vantage point, Tillinghast debunks a good many stereotypes that prevent our seeing Ireland for what it was, as well as what it has become.Most of ""Finding Ireland"" is devoted to thoughtful readings of the works of Irish writers and playwrights, including W. B. Yeats, Seamus Heaney, Oscar Wilde, and Brian Friel, as well as lesser-known names that deserve a wider readership. Tillinghast also considers the significant contributions of Anglo-Irish authors - John Millington Synge, Elizabeth Bowen, George Moore, Violet Martin and Edith Somerville, William Trevor, and Derek Mahon - with excursions into Irish architecture, music, and garden design.In contemporary Ireland, Tillinghast finds a dynamic society that has stepped out of the shadows of its troubled past to embrace an inclusive, outward-looking interpretation of its history. Intimate in tone, entertaining, and always accessible, ""Finding Ireland"" captures an expatriate's enthusiasm for his new country and its evolving identity.